I can't imagine a scenario where it is less appropriate than any other 360 tool. It's easy to use, customizable, and inexpensive. Reports are easy to interpret. Great tool for anyone looking to implement a new 360. Recruiting and human resources is a good use for this tool. To some degree, reporting is fairly appropriate as well, unless you want super detailed reports, then I would say no. Anything related to managing candidate flow and making the recruitment process easier is where this tool is best used, upgrades need to be made so it's more useful in other areas before rolling out. Completely customizable - different targets can have different competencies, rater types, rating scales, etc. The commands and controls are fairly user friendly. This is a positive because as recruiters we don't want to waste time having to learn odd or awkward controls, we just want to intuitively click. The original implementation process was fairly seamless according to industry standards. This made for a smoother rollout, testing, and implementation phase. We didn't waste too much time with overly complicated technical issues, etc. It took us a little while to figure out how to set up a 360 (we didn't watch the demo videos until later), but once we did, it was very easy to use. The reporting function needs to be vastly improved. You can run the most basic reports, but if you want to get more granular it requires customization, extra fees, and involving a developer. This piece should be made easier. The lag time between load screens, clicking new screens, etc. was very slow at times. We don't believe this was a connectivity issue, rather something on Technomedia's end. Customer support and the cost of the product would be my number one reasons. Customer support is fantastic! The system is easy to use, the Echospan support is fantastic and the cost is very competitive. Both EchoSpan and the other vendor supplied comparable products, so the major difference was the cost involved. 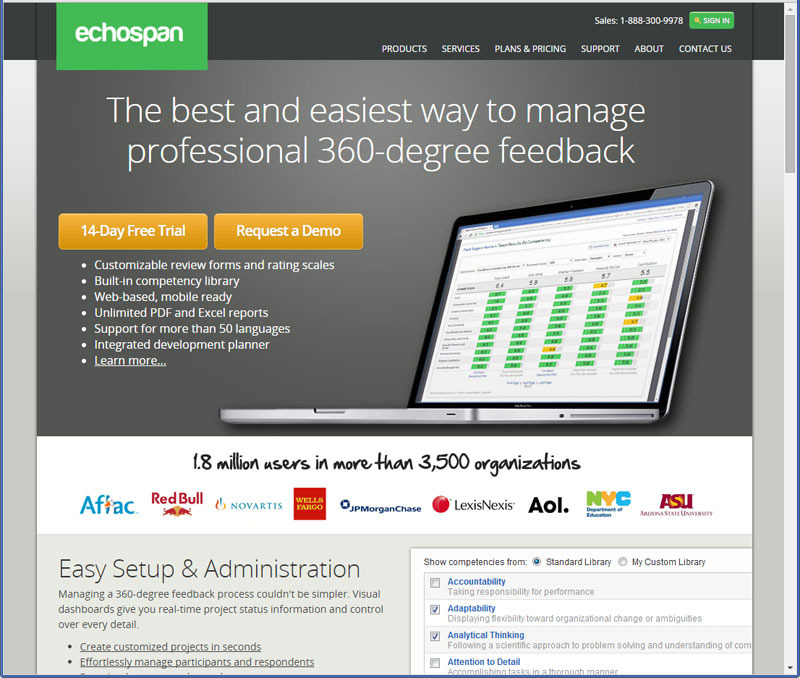 EchoSpan is much more affordable and offers a very similar quality of report. Technomedia stacks up below the other listed programs. It may solve the bare minimum of your issues, but when it comes to solving more complex issues and processes, it lacks. When you want to add additions or customize things, the process is very costly and labor intensive as well. If it were priced lower, it would make more sense, but there are much better solutions out there. The positive impact of being able to manage candidates and help the overall recruiting process has been great. The addition of new users or customizing other features has proved cumbersome, expensive, and requires additional resources.